These two photographa show exterior views of remodeling work on the Round Corner Drug Store on the corner of 8th and Massachusetts streets in Lawrence, Kansas. 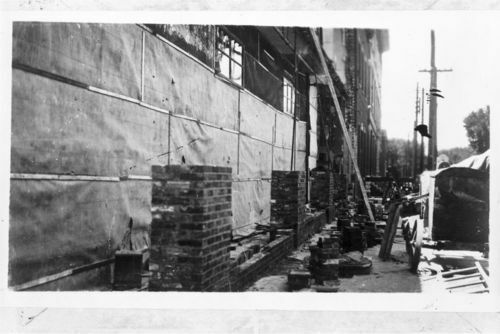 Bricks and other construction materials are visible piled up on the sidewalks, and a few men are visible in the second picture. Holding Institution: David Dary, 1981.